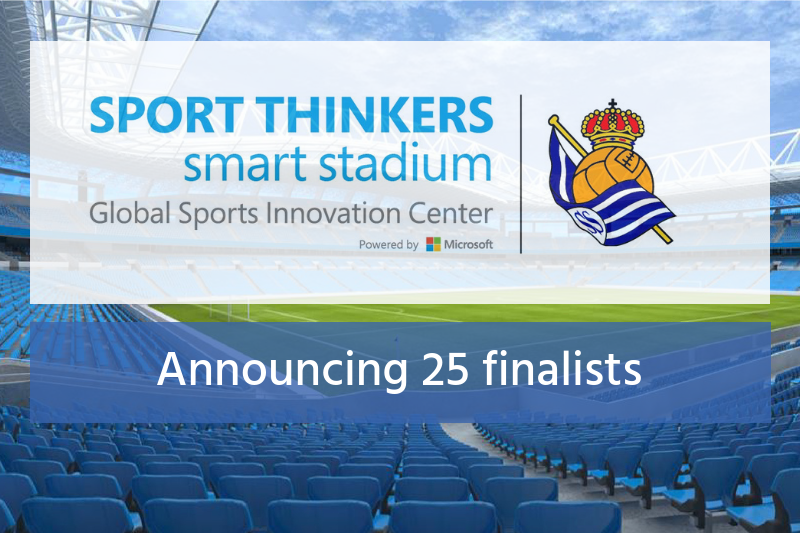 The call for the Sport Thinkers Smart Stadium had finished on September 21 and the names of the 25 finalists of this competition organized by the Global Sports Innovation Center powered by Microsoft in collaboration with the Real Sociedad S.A.D. and Microsoft are already known. This competition for technology-based companies aims to carry out actions that will support the digital transformation of the Anoeta stadium that is currently under reconstruction. The competition finalists come from 7 different countries: Australia, Spain, France, Finland, Hungary, Italy, the Netherlands, and they offer innovative technology solutions that can help Real Sociedad to connect even more with their fans and improve stadium security, as well as its sustainability. The technologies based on artificial intelligence, data analysis tools, live broadcasts, virtual reality and even robotics, are some of those that were chosen by the club and the GSIC as the result of evaluation process. The 25 finalists are: Solos (Australia), Pressenger (Hungary), Macco Robotics (Spain), Cinfo (Spain), Karma Technologies (Spain), Batura Mobile Solutions (Spain), Valorafutbol (Spain), Brintia (Spain), Imascono (Spain), Virtual Soccer Zone by Orwell VR (Italia), Iristrace (Spain), Content Stadium (Netherlands), Yerba Buena VR (United States), iXpole (Spain), NFC Sound (Netherlands), Vidibond (Spain), Open Camp (Spain), BCaster (Finlandia), Yarr TV (Spain), WIMy (Spain), Synky BV (Países Bajos), Myruns Technology (Spain), Deep Data (Spain), IMMERSIA Data Visualization (Spain), Digifood (France). Next October 8, 9 and 10, the 25 selected companies will make their pitches online presenting their solutions to a jury composed by the representatives of the GSIC, the Real Sociedad and Microsoft. The 11 winners of the competition will travel to San Sebastian in November to spend a week with the club. These companies will be able to get to know the needs of the club and the stadium in order to adapt their solutions and make projects that will be considered by the directors of the Real Sociedad to carry out a possible pilot at the Anoeta.